NO PURCHASE OR PAYMENT NECESSARY. 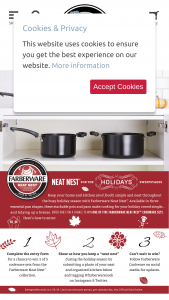 A PURCHASE OR PAYMENT OF ANY KIND, OR POSTING ANY PHOTO OR VIDEO TO THE FARBERWARE® COOKWARE HASHTAG GALLERY #MYFAMILYCOOKS WILL NOT INCREASE YOUR CHANCES OF WINNING. Participation in this Promotion is subject to your acceptance of these rules (“Rules”) and winning a prize is contingent upon fulfilling all requirements set forth in these Rules. 1. Eligibility: The Farberware® Cookware “Neat Nest™ for the Holidays” Promotion (the “Promotion”) is open only to legal residents of the fifty (50) United States (including the District of Columbia) and its territories, who are at least eighteen (18) years old at the time of Entry. Employees of Sponsor (as defined below) and its affiliates, wholesalers, or distributors, and their immediate families (spouse, parents, siblings and children) and household members of each such employee are not eligible to participate in the Promotion. Participation in this Promotion constitutes Entrant’s full and unconditional agreement to these terms and conditions and Sponsor’s decisions, which are final and binding in all matters related to the Promotion. 2. Sponsor and Administrator: The Promotion sponsor and administrator is Meyer Corporation, U.S., located at One Meyer Plaza, Vallejo, CA 94590. Sponsor utilizes the services of Wyng, Inc. for the administration of the promotion. This Promotion is in no way sponsored, endorsed or administered by, or associated with Facebook, Inc., Instagram, Inc., Twitter, Inc. or Wyng, Inc.
3. Entry Periods and Timing: Entries must be submitted by the Entry End Date for each of the eight (8) Promotion Periods listed below to enter for a chance to win the prize available in that Promotion Period. The potential winners will be randomly selected and contacted on the Drawing Date and Time for each Promotion Period listed below. For purposes of these Rules, all times and days are Pacific Standard Time. There are eight (8) Promotion Periods and therefore eight opportunities to win a prize. For a chance to win the available listed prize for each Promotion Period, you must submit your entry within the applicable Entry period. Submitting an Entry in one Promotion Period will not provide you a chance to win in the other Promotion Periods. 4. How to Enter: For the First Promotion Period: To enter, you (“Entrant”) must visit the Farberware® website at www.FarberwareCookware.com/NeatNestfortheHolidays and fill out and submit the Sponsor’s sign up form. A response to Sponsor’s prompt constitutes an “Entry” under these Rules. By submitting an Entry you are agreeing to these Rules and are representing and warranting that you are eligible to participate in the Promotion under the Rules. If you submit your Entry by using your Facebook information, the Facebook information must include information that is accurate in identifying the Entrant. Limit one (1) entry per person per calendar day. All Entries become the exclusive property of Sponsor and none will be acknowledged or returned. Proof of sending or submission will not be deemed to be proof of receipt by Sponsor. Sponsor is not responsible for lost, late, incomplete, invalid, unintelligible, illegible, ineligible, or misdirected Entries, which will be disqualified. For the Second, Fourth, Fifth, Seventh, AND Eighth Promotion Periods (Facebook Timeline Sweepstakes): To enter, you (“Entrant(“) must visit Farberware® Facebook Page located at https://www.Facebook.com/FarberwareCookware and reply to Sponsor’s Promotion-related Facebook post with a response to the prompt before the end of each Promotion Period described in Section 3. A response to Sponsor’s prompt constitutes an “Entry” under these Rules. By submitting an Entry you are agreeing to these Rules and are representing and warranting that you are eligible to participate in the Promotion under the Rules. If you submit your Entry by using your Facebook information, the Facebook information must include information that is accurate in identifying the Entrant. Limit one (1) Entry per person. All Entries become the exclusive property of Sponsor and none will be acknowledged or returned. Proof of sending or submission will not be deemed to be proof of receipt by Sponsor. Sponsor is not responsible for lost, late, incomplete, invalid, unintelligible, illegible, ineligible, or misdirected Entries, which will be disqualified. For the Third Promotion Period (Instagram Sweepstakes): To enter, you (“Entrant”) must visit the Farberware® Cookware Instagram page at https://www.Instagram.com/FarberwareCook and reply to Sponsor’s Promotion-related Instagram post with a response to the prompt before the end of the Promotion Period described in Section 3. A response to Sponsor’s prompt constitutes an “Entry” under these Rules. By submitting an Entry you are agreeing to these Rules and are representing and warranting that you are eligible to participate in the Promotion under the Rules. If you submit your Entry by using your Instagram information, the Instagram information must include information that is accurate in identifying the Entrant. Limit one (1) entry per person. All Entries become the exclusive property of Sponsor and none will be acknowledged or returned. Proof of sending or submission will not be deemed to be proof of receipt by Sponsor. Sponsor is not responsible for lost, late, incomplete, invalid, unintelligible, illegible, ineligible, or misdirected Entries, which will be disqualified. Multiple Entrants are not permitted to share the same email address or Instagram account. The authorized account holder of the email address and/or Instagram account is the natural person assigned an email address and/or Instagram account by the internet service provider, online service provider or other organization responsible for assigning email addresses or Instagram accounts for the domain associated with the submitted address or account. Each potential winner may be required to show proof of being the authorized account holder. Any attempt by any Entrant to obtain more than the stated number of Entries by using multiple/different email addresses, identities, registrations and logins, or any other methods will void that entrant’s Entries and that entrant may be disqualified. Use of any automated system to participate is prohibited and will result in disqualification. Sponsor reserves the right to disqualify from this Promotion, any Entrant it believes has violated these Rules, including, but not limited to, by tampering with the entry process or the operation of the Promotion, is acting in violation of these Rules, or is acting in an unsportsmanlike or disruptive manner. For the Sixth Promotion Period (Twitter Sweepstakes): To enter, you (“Entrant”) must visit the Farberware Cookware Twitter Page located at https://www.Twitter.com/FarberwareCook and reply to Sponsor’s Promotion-related Twitter post with a response to the prompt before the end of each Promotion Period described in Section 3. A response to Sponsor’s prompt constitutes an “Entry” under these Rules. By submitting an Entry you are agreeing to these Rules and are representing and warranting that you are eligible to participate in the Promotion under the Rules. If you submit your Entry by using your Twitter information, the Twitter information must include information that is accurate in identifying the Entrant. Limit one (1) Entry per person. All Entries become the exclusive property of Sponsor and none will be acknowledged or returned. Proof of sending or submission will not be deemed to be proof of receipt by Sponsor. Sponsor is not responsible for lost, late, incomplete, invalid, unintelligible, illegible, ineligible, or misdirected Entries, which will be disqualified. Multiple Entrants are not permitted to share the same email address or Twitter account. The authorized account holder of the email address and/or Twitter account is the natural person assigned an email address and/or Twitter account by the internet service provider, online service provider or other organization responsible for assigning email addresses or Twitter accounts for the domain associated with the submitted address or account. Each potential winner may be required to show proof of being the authorized account holder. Any attempt by any Entrant to obtain more than the stated number of Entries by using multiple/different email addresses, identities, registrations and logins, or any other methods will void that entrant’s Entries and that entrant may be disqualified. Use of any automated system to participate is prohibited and will result in disqualification. Sponsor reserves the right to disqualify from this Promotion, any Entrant it believes has violated these Rules, including, but not limited to, by tampering with the entry process or the operation of the Promotion, is acting in violation of these Rules, or is acting in an unsportsmanlike or disruptive manner. 5. Selection of Winners: On the Drawing Date for each Promotion Period described in Section 3, Sponsor will randomly select five (5) potential winners from all eligible Entries received during the First Promotion Period, and one (1) potential winner from all eligible entries received during the Second, Third, Fourth, Fifth, Sixth, Seventh, and Eighth Promotion Periods. Each randomly selected winner will be eligible to receive one (1) prize. Sponsor will contact the potential winners for the First Promotion Period via the email address used to sign up for the promotion. Sponsor will contact the potential winner for the Third Promotion Period by replying to the winner’s entry on the Sponsor’s Promotion-related Instagram post with a message prompting the winner to send a direct message to the Sponsor’s Instagram page, and to respond to the Sponsor’s request for a signed and completed Sponsor-provided Declaration and Release. Sponsor will contact the potential winners for the Second, Fourth, Fifth, Seventh, and Eighth Promotion Periods by replying to each winner’s entry on the Sponsor’s Promotion-related Facebook with a post prompting the winner to send a private message to the Sponsor’s Facebook page, and to respond to the Sponsor’s request for a signed and completed Sponsor-provided Declaration and Release. Sponsor will contact the potential winner for the Sixth Promotion Period by replying to the winner’s entry on the Sponsor’s Promotion-related Twitter post with a message prompting the winner to send a direct message to the Sponsor’s Twitter page, and to respond to the Sponsor’s request for a signed and completed Sponsor-provided Declaration and Release. Potential winners will have seventy-two (72) hours to respond to Sponsor’s notification to claim his or her prize. If a potential winner cannot be contacted, fails to sign and return the Sponsor-provided Declaration and Release or provide any other requested information within the required time frame indicated by Sponsor, or the prize is returned as undeliverable, the potential winner forfeits the prize. Receiving a prize is contingent upon compliance with these Rules and returning to Sponsor, the Sponsor-provided Declaration and Release. If a potential winner is disqualified for any reason, Sponsor may award the applicable prize to an alternate winner by randomly selecting an Entry from the remaining eligible Entries. Only one (1) alternate drawing will be held, after which the prize will remain un-awarded. Prizes will be fulfilled approximately one (1) to two (2) months after the conclusion of the Promotion. 6. Prizes: There are twelve (12) total prizes available to be won during the Promotion: Five (5) Grand Prizes as part of the first promotion period, one (1) first prize as part of the second promotion period, one (1) first prize as part of the third promotion period, one (1) first prize as part of the fourth promotion period, one (1) first prize as part of the fifth promotion period, one (1) first prize as part of the sixth promotion period, one (1) first prize as part of the seventh promotion period, and one (1) first prize as part of the eighth promotion period. One (1) prize per winner during the duration of each Promotion Period. The Approximate Retail Value (“ARV”) for each element of the prizes is based on the Manufacturer’s Suggested Retail Price; actual values may vary. Winners will not receive the difference between the actual and approximate retail values. Winners may not substitute, assign or transfer prize or redeem prize for cash, but Sponsor reserves the right, at its sole discretion, to substitute prize (or portion thereof) with one of comparable or greater value. All prize details are at the sole discretion of Sponsor. ALL FEDERAL, STATE, AND LOCAL TAXES AND FEES, INCLUDING INCOME TAX, SALES TAX, AND ANY OTHER EXPENSES ARISING OUT OF THE RECEIPT AND USE OF THE PRIZES, ARE SOLELY THE RESPONSIBILITY OF THE WINNER. Winners agree to accept prize “as is.” Prizes will be shipped to a valid address provided by the winner. No more than the stated number of prizes will be awarded. 7. Release: By submitting an Entry, Entrant agrees to release, discharge, indemnify and hold harmless Sponsor, Facebook, Inc., Instagram, Inc., Twitter, Inc., and Wyng, Inc., and each of their respective affiliates, subsidiaries, officers, directors, employees, suppliers, distributors, representatives, agents, and parent companies and each such company’s officers, directors, employees and agents (collectively, the “Released Parties”) from and against any and all claims made by winners, Entrants, or any other third parties, related in any way to the operation of this Promotion as well as any other claims, damages or liability due to any injuries, damages or losses to any person (including death) or property of any kind resulting in whole or in part, directly or indirectly, from acceptance, possession, misuse or use of any prize or participation in any Promotion-related activity or participation. 8. Limitation on Liability: (1) any incorrect or inaccurate information, whether caused by Entrants or by any of the equipment or programming associated with or utilized in the Promotion; (2) technical failures of any kind, including, but not limited to malfunctions or interruptions in network hardware or software; (3) unauthorized human intervention in any part of the Entry process; (4) technical or human error which may occur in the administration or processing of the Promotion; (5) late, lost, undeliverable, damaged or stolen mail; or (6) ineligibility of Entrant for any reason (as determined in Sponsor’s sole discretion). Entrant’s sole remedy for a confirmed erroneous deletion, loss or otherwise destroyed or corrupted Entry shall be another Entry in the Promotion, if possible. 9. Assignment of Rights: Submitting an Entry, constitutes each winner’s consent to Sponsor’s and its agents’, licensees’, affiliates’, and assigns’ use of winner’s name, likeness, photograph, hometown, and/or state for promotional purposes in any media, form, and format, whether now known or hereinafter created, devised, or developed, worldwide, in perpetuity, without further payment or consideration, unless prohibited by law. 10. Additional Terms: In the sole opinion of the Sponsor, Sponsor reserves the right to cancel, suspend and/or modify the Promotion, or any part of it, if any fraud, technical failures, human error or any other factor impairs the administration, security, fairness or proper play of this Promotion. Further, in such an event, Sponsor, in it its sole discretion, may elect to hold a random drawing from among all eligible Entries received up to the date of discontinuance for any or all of the prizes offered herein. Sponsor’s failure to enforce any term of these Rules shall not constitute a waiver of that provision. 11. Disputes: For any questions about these Rules, please contact Sponsor. All disputes, claims and causes of action at law or in equity arising out of or relating to this Promotion, the meaning or interpretation of the Rules or any prize awarded shall be resolved by applying the laws of California, without regard to conflict of laws provisions therein, and shall be solely and exclusively brought in the courts of Vallejo, California. 13. Trademarks: Farberware® is a registered trademark used under license. 14. Winners List: Winners will be announced on the Farberware® Facebook Page. For a copy of the rules and/or a list of winners, where permitted by law, send a self-addressed stamped envelope to Farberware® Cookware “Neat Nest™ for the Holidays” Promotion, ATTN: Marketing Department/Social Media, Meyer Corporation, U.S., One Meyer Plaza, Vallejo, California 94590.